Is there a better alternative to Collanos Workplace? Is Collanos Workplace really the best app in Miscellaneous category? Will Collanos Workplace work good on macOS 10.13.4? Collanos Workplace team-enables computers. Collanos helps information-overloaded teams with software that enables easy access, updating and sharing of team knowledge via peer-to-peer synchronization, online and offline. Collanos Workplace base version is free. Collaboration has never been more simple, secure and practical. Within minutes you can be sharing documents, having online discussions, and managing tasks, all in a single, consolidated space. Built on reliable peer-to-peer technology, Collanos Workplace software allows you to work anywhere, anytime, both online and offline. Collanos Workplace needs a rating. Be the first to rate this app and get the discussion started! 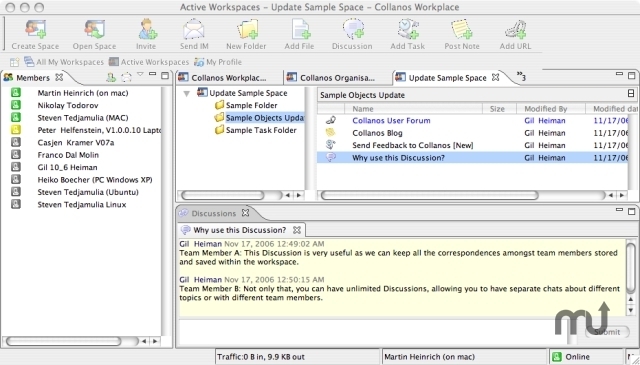 Collanos allows ad hoc, cross-organizational teams to easily access, update and share team knowledge on their computers and within the context of their activities. Teams can reach their goals faster, more securely and more effectively. Team members access shared workspaces locally on their computers, communicate with their colleagues using secure channels, and Collanos' peer-to-peer technology keeps members' workspaces in sync. On this foundation, Collanos provides dispersed teams intuitive and transparent solutions that enable superior teamwork.